Tech TTO Meters are the versatile, functional, and cost effective solutions for your application, whether Powersports, Construction, Agriculture, Landscape, Power Generation or something different. The TTO comes in three standard versions; tach/hour, engine temperature, or voltage. 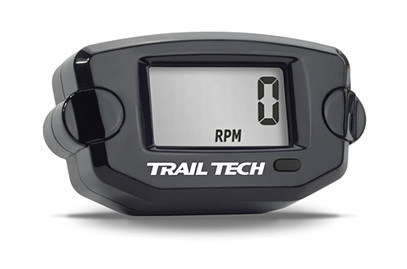 Trail Tech offer this mini maintenance meter with two mounting options (surface and panel). With extremely simple installation, add a TTO meter to nearly any type of vehicle in just minutes! The surface mounted TTO Digital Tach/Hour Gauge allows you to easily monitor your engine's RPM, total running hours and set custom maintenance reminders. TTO Temperature meters feature a clock, current and max temperatures. Large readable display allows you to easily monitor your engine's running hours up to 99,999 total hours ensuring that you perform proper maintenance on your engine. The LCD display lets you to easily view all gauge readings regardless of the angle or lighting conditions.